Whether you’re a property professional or in any other line of work, your level of productivity is critical to your success. You can often find yourself lost in a sea of ‘busy’ work and suddenly realise there’s no time left in the day. Sometimes you can’t even see any real output from your day. If this is something you can relate to there are some simple tips and techniques you can employ to boost your productivity and improve your time management. Time is your most valuable asset, you need to use it well. Putting pressure on yourself to get everything done is not going to be productive. You can easily slip into a feeling of being overwhelmed and your productivity levels will seriously dip. Be sensible about how much you can achieve and work through each task. Another way you lose time is by going into reactive mode. By this we mean picking up phone calls, answering emails, basically responding to other people’s needs and working by their schedule instead of your own. You need to avoid these distractions so that you can concentrate on your own goals. This is a hard one for lots of people as it can be nice when someone asks for some of your time. Whether it is giving someone half an hour to help them with a problem or having a chat that isn’t work related, you need to be strict and learn to say no. Working for yourself will suddenly change your outlook, as your pay-check now depends on how productive you are with your time. It can be too easy to concentrate on getting tasks done and not reflect on where your time is being spent. To understand the time consuming activities better, you need to track what you’re doing. For two weeks, record what you do. Use a blank piece of paper and plot out where your time is going. On the paper, put the days of the week across the top and half hour segments down the side. Set your alarm for every half hour and at each interval, add your activity to the tracking sheet. You can download a template of this time tracking sheet from the Boost Your Productivity Getting Started Kit . After the two weeks, review your time tracking sheet to see where your time is being spent. People incorrectly think that multitasking gets things done quicker. In fact, it usually has the complete opposite effect as you’re splitting your attention all over the place and not actually getting the tasks completed. So avoid trying to multitask. The Pomodoro Technique is a great way to keep your mind focused on one particular task. What you do is set yourself 25 minutes to complete a task without any distractions. Use the stopwatch on your phone to time the 25 minutes and when the time is up, you’ll find you’ve been concentrating more effectively on the task. Have a quick break at each 25 minute interval and start again, with the same approach. It sounds really simple but it actually works. You will see that you’re less tempted to read the email that just pinged in your email box or be tempted to quickly browse your Facebook feed. You’ll see straight away that those 25 minute sectors are being used more efficiently. Stop thinking that you always need more time! Parkinson’s Law states that work will expand to fill the allocated time. We work more productively when we have less time to complete tasks. Think about the day before you go on a holiday and how much work you get done. If you could work like that every day, how productive could you be?! Using frameworks and systems are a really effective way to free up time. Stephen Covey’s Time Management Matrix is an excellent example of how frameworks can help to boost productivity. Covey’s matrix basically helps you to prioritise key tasks. By drawing 4 quadrants, you can split your tasks in order of importance and urgency. Here is a simple image to give you an idea but you can download the full template in the Boost Your Productivity Getting Started Kit from the link below. Using this matrix, put each of the tasks from your To Do list into the relevant quadrant. The items that are not urgent but important are things like your long-term strategy and preparation, you don’t need it immediately but it is still highly important. One way that you can save huge amounts of your own time is by utilising the opportunity to outsource some tasks. If your own hourly value is over £50 for example, you shouldn’t be performing tasks that are worth less than this. There are so many jobs that can be outsourced, so employing a Virtual Assistant or paying freelancers to deliver some of your tasks will give you lots of time back. It can take time to set up the systems and processes but in the long-run it can be hugely beneficial. 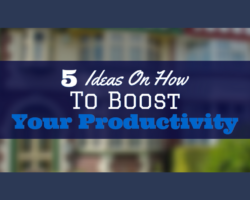 By adopting these 5 productivity techniques, you will soon start to see your productivity levels soar. They are fairly simple, yet very effective techniques, so make sure that you give them a go. Where should we send your "Boost Your Productivity Getting Started Kit"?